We are the ONLY ones in Niagara region with a clean POLICE CLEARANCE Certificate! Welcome to the Laptop Repair site for the Niagara Region. JTG Systems is the owner and service provider for the computer repair services on this site. We offer Laptop Repair in the Niagara region for excellent prices, fast service and a guarantee on all repairs. You don’t have to pay for an estimate; Its free! Niagara Laptop Repair in Welland, St.Catharines, Niagara Falls. Quickest Response time possible; Quickest repair possible with ensuring a Warranty on workmanship and YOUR list of issues are FINALLY solved.. with Confidence knowing you were serviced by an expert, not just by some random guy on Kijiji. With today’s computer technology set up properly, you can be fully functional in your home office to look for jobs online, print out resumes and get the career you want. You can even work on online. We take great pride in our ability to repair your computer properly the 1st time and the only time. We make sure everything’s up to date on your computer Including most common software such as Skype, Google Drive, Java, Shockwave player; and other common software titles that are sometimes vital to the computer’s security and functionality. MAC and PC Computer repair services offered here at JTGSystems – Niagara’s #1 Choice for computer repair… Just ask our customers. They will never go anywhere else! 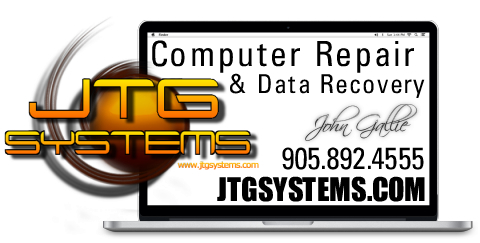 Contact us online or call (905) 892-4555 today and let us take care of all of your laptop needs! all areas of your city. laptop repair for Welland, st.catharines, and Fonthill. We repair all Major brands and non-major brands. 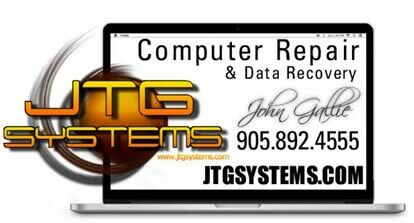 Call us at JTG Systems for all your laptop repair needs.